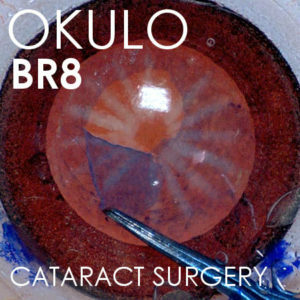 The OKULO BROWN 8 (OKU-AS-BR8) is the ideal platform for cataract surgery simulation. Practice rhexis and phaco skills with the cataract lens module (OKU-LNS-CAT). Practice toric IOL or CTR implantation with our empty bag module (OKU-LNS-EB); or leave aphakic and practice scleral fixation of IOLs through its flexible sclera. In addition, it’s pigmented angle allows training in gonioscopy skills and even implantation of piercing-type MIGS devices. Compatible with with ROMANO head.